I woke up early Monday morning, showered and got dressed. You know there are now six people in our hotel room. Simon, Eric, Blars, Möritz, Jimmy, and I have to share one shower which makes the process a bit slow. And this shower is a push-button shower that you have to hold in order to keep the water running. And the water never really gets hot. I was typing on IRC and found Matt Zimmerman on-line. We started chatting and noticed that we were in the same room. I tried looking for someone wearing a grey hat, but couldn't find him until I looked beside me. There he was, having sat down right next to ze_dinosaur. Since Mark Shuttleworth is my boss, I paid attention to his talk, and noticed that bug 35051 popped up during the presentation. You know you've been staring at too many bugs when you know which ones they are in the bug tracking system. I talked to Matt a bit about work, because Debconf is a good time to talk about QA, right? We finished up our discussion, typed a bit on our laptops, and decided that food would be a good idea. We found some people from Intel, who introduced themselves as Mike, Mark, and Denise. I thought that Denise's name sounded familiar and then I realised that she's Denise Cooper, who worked on opening up Sun's source code. I was so happy to finally meet her, since we had talked years ago. We walked towards town to get some better food and picked up Blars. Then we saw xtat, whom I knew only from LiveJournal, and Tiana Galante. I invited them to join us and we walked around town for a while. We went to this Argentinian restaurant, called Rincón del Viejo, that had napkins on the table. I didn't want to get my hopes up, so I expected something plain, but everything was incredibly delicious. 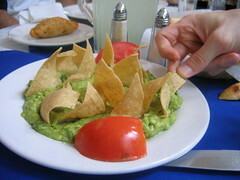 We started with some wonderful empanadas, a delicious tomato salad, and guacamole y totopos. Then I ate queso con chorizo. By the time we finished, we were all completely stuffed. We picked up some pesos and then decided to walk off this big meal. We went exploring the town and wandered about a bit. We hiked up a hill and found a street full of vibrant colours. I realized that we were in the construction district, with stores selling paint, lumber, sinks, pools, and even hand-painted tiles. A little bit further on, past some clothing stores, we found a very cute hotel that looks like it would be really fun to stay in. 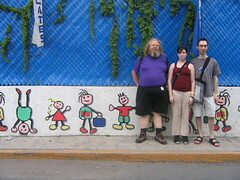 We found a daycare with an awesome wall, with little figures dancing about. There was a little kid who was standing inside a florists, drumming on the counter and looking very bored. Another child ducked into a used television shop. After about an hour or so, we were hot and thirsty so we decided to head back. But before we returned to the resort, we stopped at a fruit store and picked up some fruit for breakfast. Boy, oh boy, is that fruit every good. Mangos were fragrant and sweet and juicy. Bananas are just heavenly. The plantains were just wonderful. If only we could get fruit like this in Canada. And I don't even like eating fruit. It's "empanadas" and not empañadas ;-) Just out of curiosity, empanada (one big thing, you just eat pieces of it) or empanadillas (small, in thhe shape of a half moon, can be either fried or baked)? Thank you! My spelling is quite poor. They were fried empanadas, which were very tasty. We do get said fruit in Western Canada, where the weather is not unlike that in Mexico - today's high was 31C. Except they have fresh fruit constantly! You can even walk up to mango trees and pick some mangos.